This exercise was part of an EU FP7 Blue Skies Project aimed at piloting, developing and testing in real situations a foresight methodology designed to bring together key stakeholders to explore the longer term challenges that face their sector (or cut across sectors) and to build a shared vision that could guide the development of the relevant European research agenda. This approach was applied to the first theme selected, namely “Application of Breakthrough Technologies to Adaptation to Climate Change in Agriculture”. This met the criteria for a sectorally driven topic, was research-driven and involved a clear and vital European policy challenge. Moreover, from an early stage, there was strong stakeholder engagement from the Standing Committee on Agricultural Research and the Directorate-General for Research in Agriculture, Forestry, Fisheries, Aquaculture. There is a general consensus that agriculture in Europe will confront major challenges related to rising global temperatures, an increasing number of extreme climatic events and a series of consequences which may occa-sionally be positive but the sum total of which threaten food security, health and well-being, particularly but not exclusively in rural regions. The urgency of mitigation measures should not be minimised, not least because of the substantial contribution agriculture itself makes to greenhouse gas emissions. Nonetheless, the reality is that such measures at this stage are only likely to offset what is to come. In consequence, thinking is already focusing on strategies for adaptation. The exercise built on the foresight work of the Standing Committee on Agricultural Research (SCAR) and the Directorate-General for Research and Innovation (DG RTD), Agriculture, Forestry, Fisheries, Aquaculture, which had generated two important reports. A strategic link was also established with the group working on the Joint Programming Initiative developing in this area. Sev-eral meetings were held with DG RTD to improve the mapping of the research and ‘innovation ecology’ or ‘eco-system’ (an underpinning concept of the project which emphasises flows and interdependencies in the innova-tions system) and to discuss the appropriate tactics for interfacing with this community. An initial description of the ecology was prepared as background for the workshop, and the event was held in Brussels on 14 December, 2009 with the participation of 26 senior experts in agriculture and related technologies, policy and foresight. The purpose of the workshop was to bring together these experts from the domain of agricultural research and associated policy and user areas with thinkers and specialists from outside to explore a foresight vision of the contributions that breakthrough technologies could make. Since such technologies could have profound socioeconomic consequences or even demand major socioeconomic change as preconditions, the socio-economic dimension must also be prominent. To open up scope for innovative thinking, the first part of the workshop focused on articulating the challenges of ad-aptation in the form of a “functional specification”, for example the level of salinity tolerance that a major crop would have to achieve or the need to increase cloud precipitation in a cost-effective way. A second session considered the potential of breakthrough technologies for adaptation, whether in isolation or through convergence. Workshop participants were then asked to co-construct a success scenario for the year 2050 in which European agriculture (or its functions) will have made the best use of potential breakthroughs to adapt to climate change scenarios. On the basis of the success scenario, attention then focused on the steps needed now and in the coming years to achieve the desired outcome. 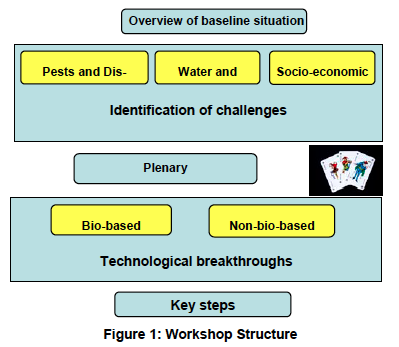 In this case, the tailored structure was based upon identi-fication and prioritisation of challenges in the domains of pests and diseases, water and land, and socio-economic dimensions. With an intervening wild-card exercise, the second main step involved identifying potential solutions to the challenges resulting from breakthrough technolo-gies in bio and non-bio domains. The timescale was 2050 in recognition of the rate of change of drivers and effects. The aim of the exercise was to pilot and test in real situations a foresight methodology designed to bring together key stakeholders to explore the longer term challenges that face their sector (or cut across sectors) and to build a shared vision that could guide the devel-opment of the relevant European research agenda. This includes identifying the changes in the European research and innovation ecosystem that would be needed to take forward that agenda. The target is not the Eighth Framework Programme in isolation or the specific case of the Joint Programming Initiatives but rather embedding them as core elements of wider cooperation and coordination mechanisms and proc-esses around the challenges facing the sectors exam-ined. The project combines the core approach of the “Success Scenario Workshop” with the mapping of the research and innovation ecosystem to address differ-ent types of research and innovation challenges. The “Success Scenario Approach” is an action-based approach, which helps to generate a shared vision among senior stakeholders of what success in the area would look like, specified in terms of goals and indicators, which provide the starting point for developing a road-map to get there. The purpose of having such a vision of success is to set a ‘stretch target’ for all the stakeholders. The discussion and debate involved develops mutual understanding and a common platform of knowledge that helps to align the actors for action. In practice, the struc-ture of a workshop begins with a consideration of key drivers or challenges, builds a vision of success, and then focuses on actions to make the vision a reality. The work-shop helps to flag hidden bottlenecks and constraints pre-venting progress as well as windows of opportunity for joint policy coordination and action. Important outcomes of these workshops are the insights they provide in terms of the level of maturity in policy design and development and the viability and robustness of long-term policy scenarios to guide policy-making. The workshops also provide indi-cations on whether there is a need for further discussion to refine thinking and policy design and/or to bring additional stakeholders into the discussion. 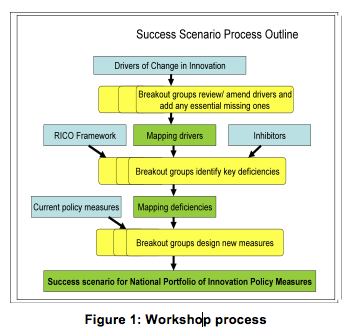 The workshop approach is supported by a mapping of the research and innovation ecosystem, a concept that stresses the interdependencies between actors in re-search and innovation – here understood broadly to include policy as well as industrial innovation. 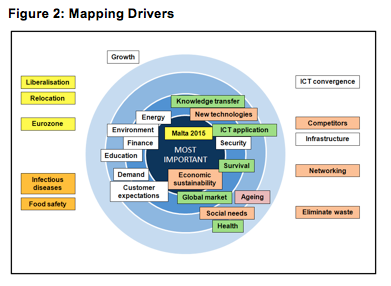 The map articulates the identities and roles of key actors, the networks in place and the flows of money and knowl-edge. It also provides an overview of existing initiatives and the level of maturity of the system, how well it is working and whether networks need to be re-aligned or re-configured. Towards the end of the process, road-maps or implementation plans are developed identifying the key steps to be taken to put European research in the area on the appropriate footing. The Farhorizon Agri-climate Workshop working group discussions were structured on the challenges arising from climate change impacts on agriculture in three key areas, namely pests and diseases, water and land, and socio-economic aspects (including events outside Europe). Each cluster of challenges is explored in more detail below. Early warning systems: Among the key impacts identi-fied in the first cluster were the migration of pests from hot countries and the need to detect and control the spread of invasive species. This requires action on a number of levels, including efforts to improve detection of invasive plant species or crops bringing new pests and diseases into Europe. Accuracy and timeliness of detec-tion systems is key for effective responses, hence the need for robust monitoring and early warning systems for picking up signs in initial phases. Sophisticated ICT-based expert systems together with smart technologies can detect weeds (and hidden pests) in imported plants. Genetic engineering and genomics: In Europe monocul-tures represent a major problem due to additional risks relating to pests. There is a need to plan a shift to polycul-ture for a more diverse set of animals and plants. Genetic engineering has focused on one particular challenge while it also needs to address other challenges, such as adapt-ing existing crops quickly, genetic traits for animal health and the potential of genomics for enhancing plants’ ca-pacity for survival in stressful environments, requiring a focus on a broader genetic strain. Territorial diversity and local, traditional knowledge: Re-search challenges range from experimentation with di-versified cropping to research on viroids and the spread of pests and human allergies. Despite territorial diversity in climate impacts, regions do not operate in silos result-ing in cross-impacts on bordering regions. This highlights the need for closer cooperation between disciplines in-cluding ICT, GIS, ‘omics’ (refers to disciplines that have the omics syllable in common, e.g. genomics) and taxon-omy. There are concerns about a shortfall of plant spe-cialists and taxonomists and the loss of traditional knowl-edge due to the growing attraction of genomics. The second cluster relating to climate change impacts on water and land can be divided into (i) ‘general impacts’, i.e. changes in temperature, solar radiation, rainfall, changes or increases in toxic air(borne) pollutant levels, water shortages, changes in plant types, changes in carbon dioxide levels and impacts on ecosystem(s). 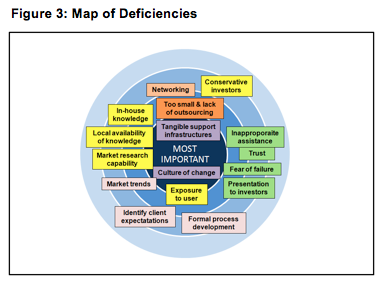 The speed of change in systems and their (and our) ability to respond is a key issue now (i.e. from traditional national systems and cultures to new global set-ups). (ii) ‘Water quality impacts’ – i.e. groundwater being affected by changing quantities of rainfall, potentially allowing the concentration of pollutants etc. to increase; changes in the relative priorities for water use compared to the cur-rent priority of drinking water quality over agriculture water quality. Increased biological activity is proportional to temperature increases, which could reduce water quality. (iii) ‘Water quantity impacts’ – i.e. droughts, floods and the generally shifting availability of water in space and time. Climate change could generally decrease the resis-tance and resilience of species (plant and other). (iv) ‘Impacts on land’ – i.e. mineral transport processes will be affected; soil dynamics will change (change of soil fertil-ity); desertification will alter land use; there will be a modi-fication in soil flora and fauna; where people live (have to live) may change; ‘ecosystem’ goods and services supported by the land will change; there is a changing sus-ceptibility of a variety of these things due to temperature. The foreseen impacts range from the urgency to de-velop new economic and agriculture models to invest-ments in technologies that are cost-effective, reliable and acceptable to society. These impacts can lead to ten-sions, insecurity, instability, especially in developing countries, due to scarce resources to address these con-cerns. This poses a general challenge of how to detect the tipping point in these situations and take action to reduce these tensions. Free trade discussions are ne-glecting climate change due to potential conflicts with the objectives of WTO negotiations. This calls for cli-mate change issues to be given a higher profile on the WTO agenda. Europe needs to develop an integrated response to economic growth, free trade and climate change based on improved communication between institutions and policy sectors, and ultimately new mod-els of economic growth decoupled from fossil carbon. A potential impact with socio-economic effects is the emergence of local threats to agricultural systems lead-ing to the abandonment of sectors. Sectors of activity are in this scenario threatened by diseases, lack of water and other effects caused by extreme weather events. The challenges involve adapting to novel situations by new breeds and/or new technologies, investing in new tech-nologies, supplying information, educating and training people to adapt to necessary changes in lifestyle, and improving communication on climate change issues. In such situations, an increase in climate change refugees is envisaged, creating a dual challenge of prevention and integration. The means identified were international co-operation, technology transfer and education. Another key challenge is to identify effective means for keeping the environmental impact of intensification to a minimum through a new model of sustainably competitive agricul-ture based on: 1) profitability at farm level, 2) marketabil-ity of food products, 3) environmental sustainability, 4) coping with climate change, 5) energy efficiency and 6) coping with competing land uses. Developing and imple-menting this new model will require a very high level of policy coordination at the national, EU and global level. This model would address land management through transparent, effective processes for mediating conflicting uses, the introduction of new climate and agri-technologies based on public acceptance and the adaptation of educa-tion systems to promote change in lifestyle. The scene for the success scenario was set with refer-ence to future historical events including a Second Great World Food Crisis in the early 2040s, in which Europeans will have been forced to change their diet but where prescient actions taken to prepare the agricul-tural system from 2015 onwards will have insulated the Continent from the worst effects of climate change. A review written from the perspective of 2040 of the past 40 years illustrated how two generations of researchers were able to engage with a series of challenges and bring with them Europe’s timely actions to provide impor-tant insights on how proactive, forward-looking ap-proaches can be realised through joint transnational re-search initiatives. It referred to how farmers will have become increasingly used to facing the impacts of climate change reflecting the risks identified in the work-shop. • Networked specialisation (a trans-European network of institutions synthesizing a large pool of knowledge). • Energy adaptation based on a mix of approaches including reduction of transport in production and dis-tribution, design of greenhouses that capture energy rather than use it, and breakthroughs in bio-energy from trees alleviating stresses on land use. • Fertilisers that use less material input (potassium and phosphate) and less energy in their production. • New varieties of plants with a reduced need for fertilisers and new varieties of fertilisers from manure and nitrogen fixing in grasses. Opposition to geneti-cally modified crops was dissipated by creating plants designed to be low risk (for example without the ability to spread pollen). • Water use and drought resistance are critical factors particularly for Mediterranean regions. A multifaceted strategy includes the selection of plant varieties to con-serve water and breeding of drought resistant varieties. researchers placed it in a strong position to spearhead change at the European level. In summary, as a result of an early investment in capacity-building to cope with the climate impacts on agriculture from a range of perspectives (policy design, implementa-tion, knowledge capture and transfer), the success sce-nario describes an agricultural landscape in Europe 2050 that is highly diversified and yet robust to climate change effects. The success scenario also includes a retrospective on policy describing a situation where societal challenges dominate the bulk of effort and resources in the European research and innovation ecosystem. Reference was made to a situation in the early part of the century where the research and innovation constituencies is largely separate and the public viewed researchers as an isolated elite interested mainly in securing a continuous flow of funding. In this scenario, the financial crisis causes researchers to be much more explicit about how their work will contribute to economic recovery and major societal challenges. At the same time political, business and social leaders will have reassured the scientific community that substantial funding will be reserved for investigator-driven research but that much more effort will be made to ensure success-ful translation of the results of that work. Building the con-stituency to address the grand challenge of adaptation to climate change in agriculture will have been aided by or-ganisational innovations, including policy platforms that bring together a range of stakeholders responsible for policies relating to agriculture, climate change, research, and innovation, as well as the players in the field (re-searchers, farmers, business and intermediaries), who will have been sensitised to the challenges at a very early stage. Foresight actions will also have been used to help build a common vision and mobilise the participants. This approach was intended to provide a practical dem-onstration of ways in which foresight involving key stake-holders can help develop new initiatives at European level. In practice, the Farhorizon workshop was placed in the context of a sequence of foresight activities, and it is fair to say that the net effect of all of these activities helped the agriculture and climate change research com-munities to become one of the first to engage realistically with the Joint Programming Initiative and to position itself for further opportunities within the Innovation Union framework. In terms of content, the workshop reinforced and extended certain conclusions of its predecessors and made a distinctive contribution by demonstrating the po-tential of breakthrough for non-bio-based technologies to contribute to the adaptive response to climate change in European agriculture. Within the bio-based list some more controversial issues were also made explicit. European Commission [EC] (2009), ‘New challenges for agricultural research: Climate change, food security, rural devel-opment, agricultural knowledge systems’, 2nd SCAR Foresight exercise, DG Research, Brussels: EC.